sending notifications to the mobile application. The "BUY" or "SELL" proper signals appear after closing the current candle. The "Coming Buy" or "Coming Sell" signals are created during the drawing of the current candle and may disappear at that time. You can freely combine each of the 10 implemented setup filters. Important!! In order for the trading signal (Buy or Sell) to be created, the conditions of all active setup filters should be met at one time. Auto Trade mode allows automatic opening and closing of positions by the Scanner. In this case, the size of the opened positions is determined by the Fixed_Lot parameter. Important!! The Auto Trade mode is just an addition. It is true that it allows full automation of trading, but it is not, in my opinion, the best solution. I recommend trading manually, based on signals (BUY, SELL) generated by Scanner. SW_X_shift =750 - shift the scanner buttons, horizontally. 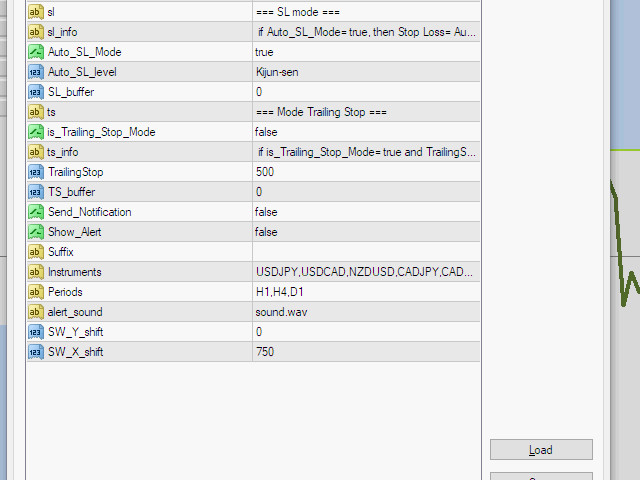 I added the function of automatic setting of Stop Loss in Auto_trade mode. The position size is automatically calculated. 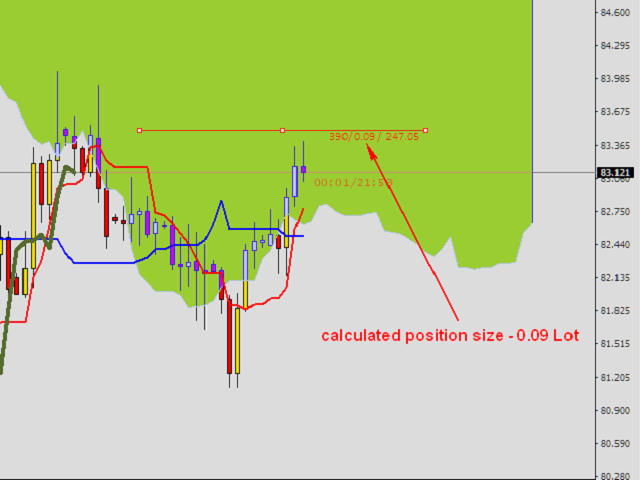 Taking into account the position of the SL and the assumed percentage risk. The Trailing Stop function can also be carried out in a traditional way (at a fixed distance from the price level), or in relation to the position of the above-mentioned lines. This is not St. Gral. It is also not a machine for making money. If anyone knows only the basics of Ichimoku, or does not even know it, he can not expect too fast success in trading, even if he uses a scanner. Do not ask me about the ready parameter settings, those that are a guarantee of earning money. I am not too satisfied at this time. At the moment of typing, the EA is losing 2134.00 on a trade it took with the USDJPY. Also, it seems unfair the creator only allows 5 activations, but continues revising the product, right? Since October of last year the EA has been revised from 2.22 to 2.27. In order to get the updates and fixes, one must use up their activations. I have two left and then, I would have to purchase the indicator again? I don't think so! How is that fair? Forget getting any help from the people at MetaTrader. I have learned they just don't care about the customers. 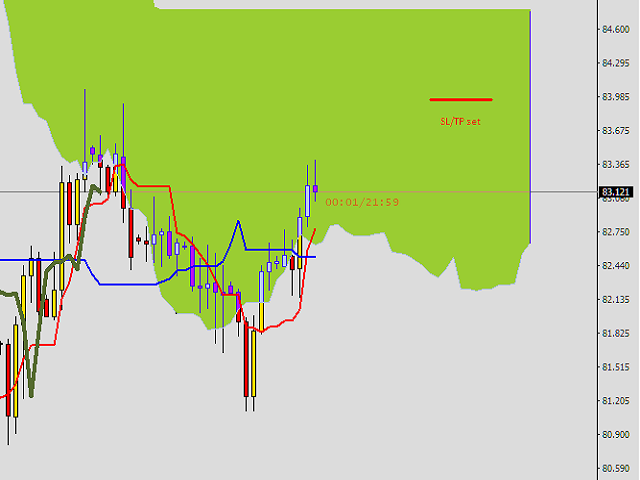 I like Ichimoku Market Scanner EA. Very useful for me. I agree with 5 stars. Good tool, professional support, I like it. TP_MODE added. Default distance is 500 points. Changing the description of a comment when manually opening a position. Changing the way Alerts display. The ability to change the font size and size of buttons has been added. 1. Some brokers prevent trade for a few minutes at the time of changing the D1 candle. 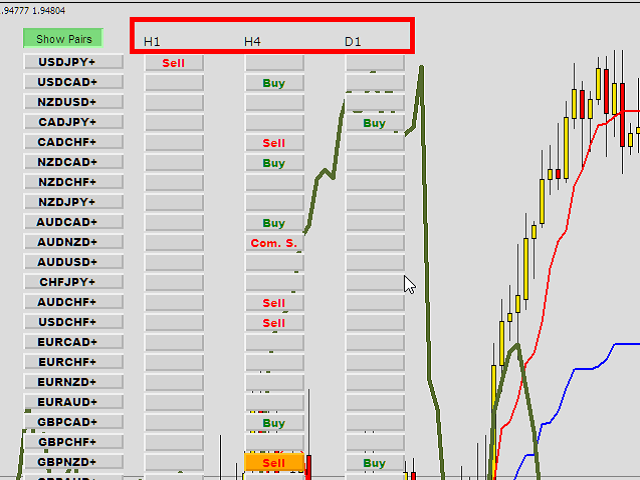 This meant that in the automatic trading mode the scanner did not open positions in such cases. The change in the "Open_candle_delay" code makes the scanner wait for a specified time (default 300 seconds) for the broker. 2. Buttons with pair names and simultaneously showing the result on each pair now flash in two colors, in the case when the result is positive but is not protected by SL. This is a suggestion to protect your position from loss. Small bug corrected. The error consisted in removal the scanner from the graph in case of observation of only one instrument. The functionality of automatic SL setting has been added in manual trading mode. The color of TF descriptions changes automatically (M5, M15, H1, etc). If the background color is black, then TF descriptions will be displayed in Light Gray. In other cases, the descriptions will be in black. 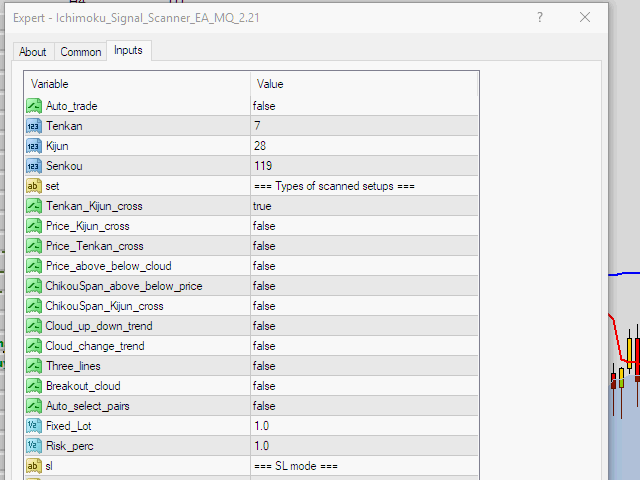 Also improved the scanner's functionality in "Auto_select_pairs" mode.